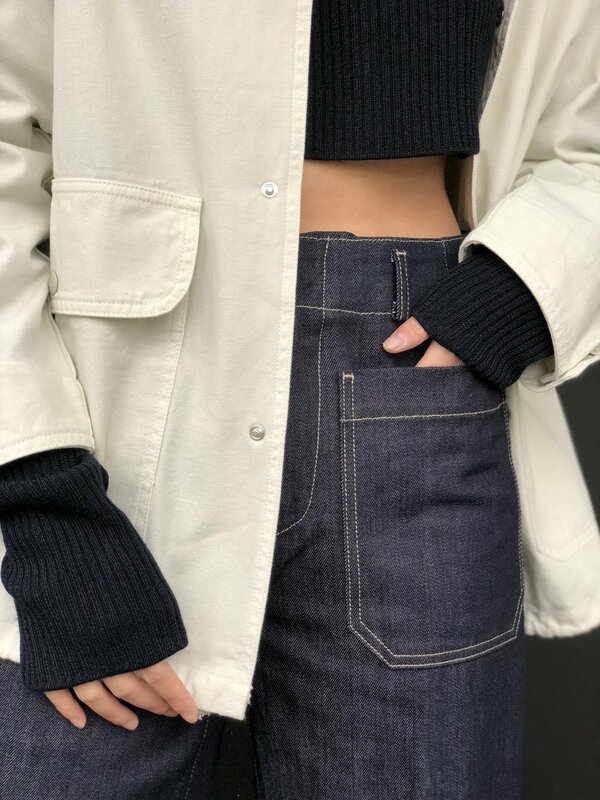 Our favorite indigo pieces from Japanese line Blue Blue are back for SS19. Introducing Boboli’s newest team member- Faye! She’s here to tell us what her favorite things are in store. Outfit #1 for Faye is comprised of a Labo Art jacket, Jil Sander knit and jeans by Sofie D'hoore. Outfit #2 is head to (nearly) toe Jil Sander. jacket, skirt and shirt can all be worn separately. Up close on those sleeves. Favorite Item #1 - Maison Margiela weekend bag. Favorite Item #2 - Jill Sander multi-way bag.
. . . wear it like this . . .
. . . or like this . . . Favorite Item #3 - JW Anderson ear cuff. Hey Faye - thanks for playing! 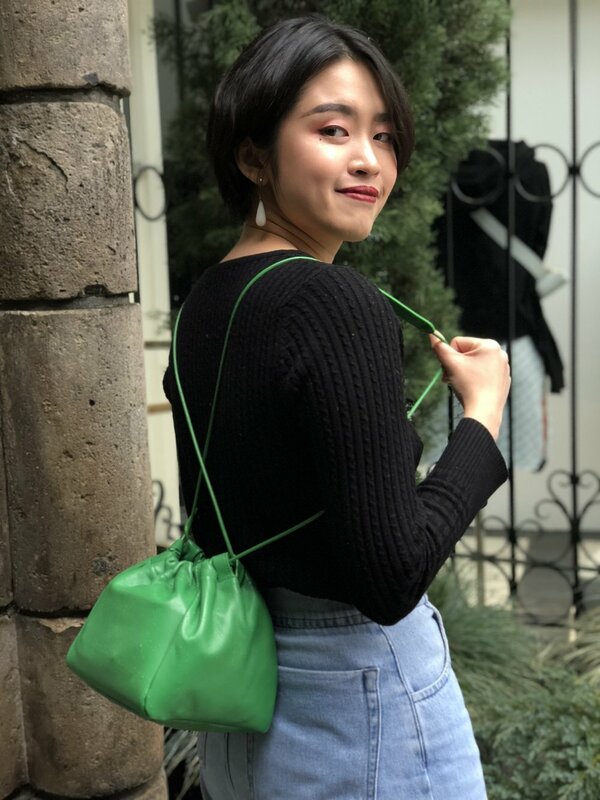 Spring is JUST around the corner and we have Yura’s favorite pieces and picks for the upcoming season. Outfit #1 features top, pants and coat by Loro Piana. Plus coordinating ring by Jessica Biales and a classic Valentino handbag. Yeah . . . the coat is reversible. Outfit #2 mixes a couple of our faves. Yura wears a Fabiana Filippi jacket with Erika Cavallini pants . . . Hands free bag by Lutz Morris and perfect knit top by Fabiana Filippi. Just in case you wanted to see those stripes close up. Favorite Item #1 - Vintage hand-painted Rolex by La Californienne. This watch looks very comfortable perched on top of this Loro Piana sleeve. favorite Item #2 - La Double J dress. Sitting pretty . . .
. . . and casually standing with hands in pockets. Favorite Item #3 - Issey Miyake bolero cardigan. From the back now y'all. 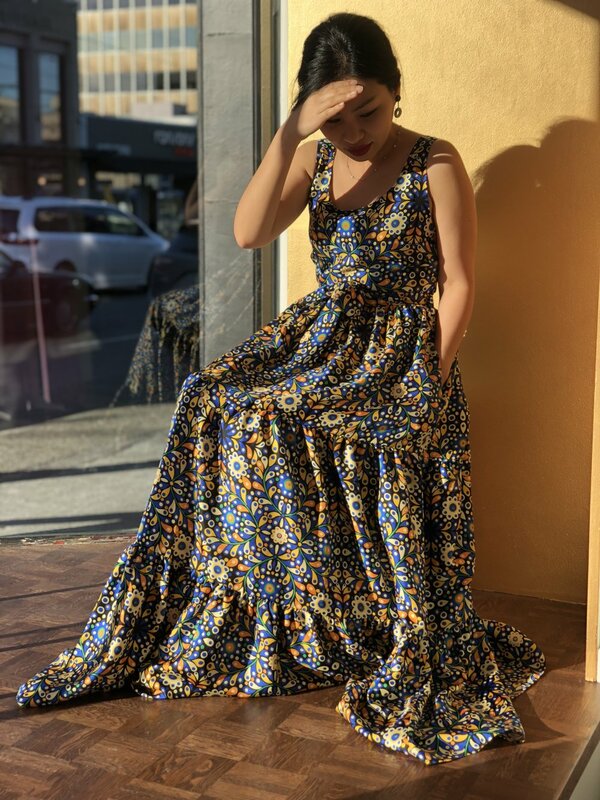 Our girl Liselott is kicking off Round 2 of staff picks.
. . . wear it as a skirt . . .
. . . or wear it as a dress - you know we love a two-fer. But we love it with this skirt. It's a real show-stopper. Much like the chick modelling it. Outfit #2 - starring Erdem with supporting roles by Golden Goose Deluxe Brand, Loro Piana. Up close on the deatials - especially a Liselott Montesano creation. That Loro Piana coat from the back. Favorite Item #1 - these groovy No21 pants. Also notice the Lutz Morris bag, Pierre Hardy sneaks and more No21 by way of a silky t-shirt. Up close on those side stripes. favorite Item #2 - this freakin' fantastic Foundrae ring. . . . . zoom in. And last but certainly not least: Favorite Item #3 - These stellar Pierre Hardy sneakers. Our special correspondent Rosie Daykin tagged along on Margie ‘s latest buying trip in Paris. Here are some of her highlights. The ladies also visited Officine Generale. Here's a sneak peak. Next stop was Paul Andrew where they spied the "Martini heel". The "Martini heel" from the front. Va va voom!
. . . keeping hydrated is very important. Crushed velvet sling-backs and slides have arrived from rosetta Getty. and that’s just the tip of the iceberg. You know her and love her . . . . Happy Friday from the one, the ONLY, Lee! For outfit #1 Lee has chosen a floral Erdem suit, Valextra Iside bag and new Rosetta Getty slides. B! *$# stole her look! Outfit #2 includes shirt(s) and trousers by No21, plus JW Anderson boots. Favorite item #1 - Lee has been coveting this JW Anderson blouse since it arrived in store. Trousers are No21 and boots are JW Anderson. Favorite Item #2: Lurex Etro sweater. She's pretty H A P P Y about this Etro Tee too. Two thumbs up for Etro! 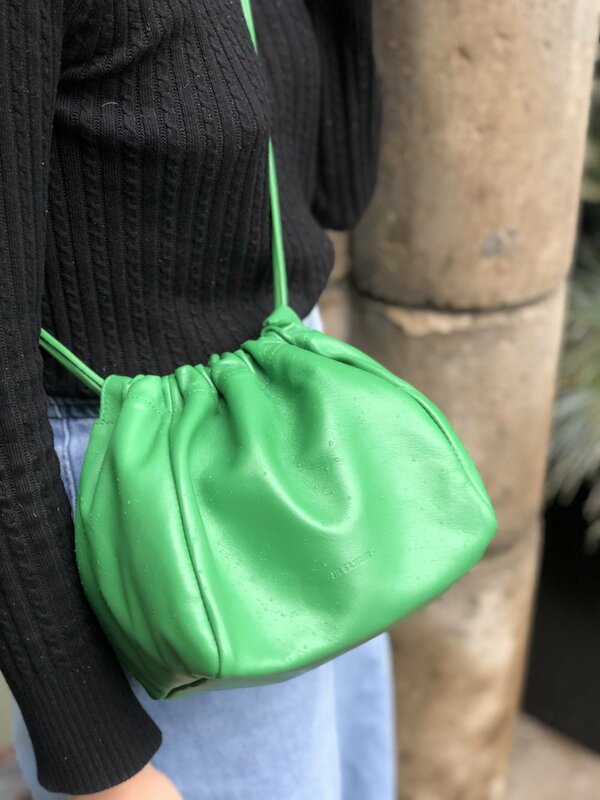 Favorite Item #3: This vegan leather Stella McCartney bag.
. . . and remember Boboli wouldn’t be Boboli without Lee in it. Meet the delightful Sihan! You may recognize her from our Instagram feed. It's a total white-out in Outfit #1. Sihan wears Maison Margiela Sweater and skirt with boots by JW Anderson. Brand spankin' new bag by Lutz Morris. Nice pick Sihan! Margaret says this is "Mono-chromagic." Perfect pearl earrings by Poppy Finch. Outfit number two features Golden Goose Deluxe Brand sweater, jeans and boots - topped off with an Etro jacket. Favorite item #2 - Maison Margiela pouch. Favorite item #3 - Tabitha Simmons boots. We ran out of these beauties in Sihans size so . . . .
We love you Sihan - you're a treasure! Meet Zenija (Z). She's the woman that manages the IG feed, the webby as well as Boboli's graphic design and photography. We're kicking off Outfit #1 . . .
. . . in Massimo Alba sweater, Sibel Saral trousers and Golden Goose sneaks. The honest to god softest sweater you will ever feel. Outfit #2 is seriously good. The cashmere sweater and suede skirt are both Gabriela Hearst and the oxblood boots are Paul Andrew. The skirt is a piece of art - laser cut to perfection. "one of a kind" in that we only have one. Run don't walk. Z's three favorite items revolve around her one favorite Missoni turtleneck. Favorite item #1 : Mame Kurogouchi skirt. Favorite item #3: This show-stopping curduroy suit by Golden Goose Deluxe Brand - killer heels by Tabitha Simmons. Favorite item #2: Dressing down in a men's Blue Blue coat. Furry pockets - yes thanks. Z's out with a laugh and an eye-roll and a brilliant blue Officine Generale sweater. Lutz Morris is a German based and born luxury leather goods company. With an emphasis on the integrity of design and quality of materials we are proud to include Lutz Morris in Boboli’s list of designers. Meet Nina one of our newest staff members. She’s shy but has great style and she’s prepared to share here favorite looks and items with us. Nina's dressed for evening in Erika Cavallini dress and Rosetta Getty jacket. Outfit #1: Nina does her best Sporty Spice impression in plush Stella Mccartney tracksuit.
. . . not your average tracksuit. Outfit #2: Maison Margiela Coat and sweater dress with Valentino boots. Nina's #1 fave item is this slick Maison Margiela jacket. Just W O W ! Favorite Item #2 is borrowed from the boys - Officine Generale baseball cap. Favorite Item #3 . . .
Rock on with this remixed rock-stud purse. Introducing our gal Michelle ! Michelle - she may look like an angel here in Stella McCartney . . . but . . .
Michelle styled fellow staff memeber Nina in two killer outfits. First - nearly head to toe Margiela. Toes by Paul Andrew. She's also a bit of a devil. But hey, life is all about balance . . . and we can always count on Michelle to keep us laughing. We love this little pocket detail. Second up: this G O R G E O U S Roland Mouret gown. Perfect for upcoming holiday events. Michelle's picks include: 1. One of her favorite candles by Cire Trudon. 2. Valextra clutch. She likes bot hcolors so much. Why pick just one. 3. Foundrae necklace. Can you tell we L O V E Foundrae? Cam put together a couple of looks for us (with a little help from the boss). He also chose three of his favorite items in the store . . .
Look #1 - Cam is wearing a coat from Officine Generale, shirt by Loro Piana, trousers by Ami Paris and Maison Margiela shoes. Look #2 - Cam looks pensive in a Loro Piana coat, Ami Paris sweater, jeans by Standard Trade and shoes from Pierre Hardy. "The denim is a little stiff at first, but relax into THE most comfortable jeans." Next up, a very practical choice for a very practical guy. The Veilance coat with detachable hood. The technical fabric took years to develop and is nothing short of incredible. Because Cam is a bit of a golf guy, but even more of a cocktail guy . . . He chose these vintage Hermes cocktail sticks. Yura is trilingual (Mandarin, Korean and English). She's a mom to one cool little dude. We love having her on our team - you can catch her in store on Mondays, Tuesdays and Wednesdays. Yura's top 3 picks . . . starting with this No21 cardigan (perfect for the holiday season).
. . . and finally, this Foundrae karma necklace. Yura's daytime look featuring Rosetta Getty knit and skirt plus Paul Andrew boots. Up close on those colors. Yura's stunning evening look - more Paul Andrew this time paired with L O V E - ly Giambattista Valli. We’ve got the Blue Blues! Every week we're highlighting a beloved member of our Boboli Family. We think they’re pretty cool and we think you will too. Hey everyone! This is Margie (and her husband Cam). For those of you who don't know her, Margie is our fearless leader, store owner and general boss lady. Because we love Margie, we want to share with you a few things from Boboli that she loves. Starting with . . .
. . . her boots. These beauties are by Pierre Hardy and she has literally worn them everyday since she bought them. Next is . . .
. . . this vintage hand painted rolex watch, This baby is by La californienne and we are O B S E S S E D.
t’was love at first sight. Modeled by her youngest (Elizabeth) . . .
. . . a daytime outfit featuring No21 coat and skirt plus Ami Paris sweater. Modeled by her eldest (Claire) . . .
. . . an evening look starring a Giambattista Valli gown and boots by Paul Andrew. Boboli is thrilled to be carring Eleventy in our menswear department. Fendi born Delfina Delettrez - puts her innate design genes into fantastical bee-spoke jewelry.